I visited Belfast for the first time last month. Armed with a pathetically cursory understanding of the Troubles, I took a tour around the very streets in which '71 is set, and had my eyes opened so wide I thought they might fall out. I naïvely thought everyone had made friends, shaken hands and got on with their lives after the Good Friday Agreement, but while Belfast itself is an incredibly welcoming city, it turns out the area between Falls Road and Shankill Road still simmers with an edgy tension. I was amazed to discover there are still peace walls scattered throughout West Belfast: ostensibly insurmountable barriers keeping Protestant Unionists and Catholic Republicans divided in order to reduce the chances of nightly violence. I mention all this not to prepare you for my holiday snaps but because my ignorance about the city helped me identify in some small way with '71's Gary Hook (Jack O'Connell), one of a platoon of British soldiers shipped off to Belfast to deal with the "deteriorating security situation" in director Yann Demange's astonishing, eviscerating debut feature. Disappointed that they're being deployed in their own country rather than Germany, the platoon have literally no idea how foreign Northern Ireland will be to them; in 1971, the Troubles were still in their infancy and the average Brit was almost as unaware of the situation as I was a couple of months back. 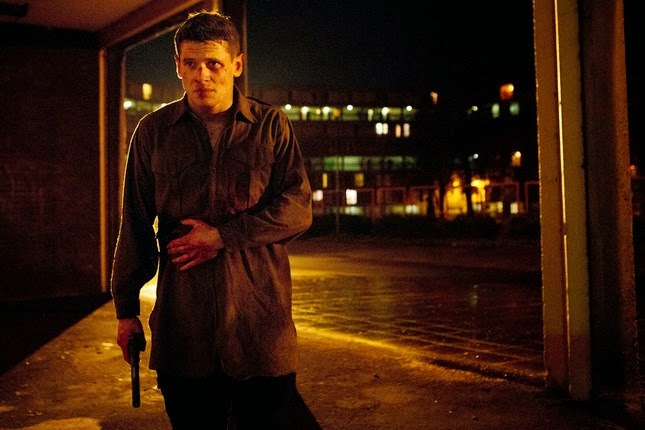 The setup is deliciously simple: Gary becomes separated from his unit during an uncomfortably well-realised riot, and spends the night trying to avoid being murdered by Brit-hating Republicans. 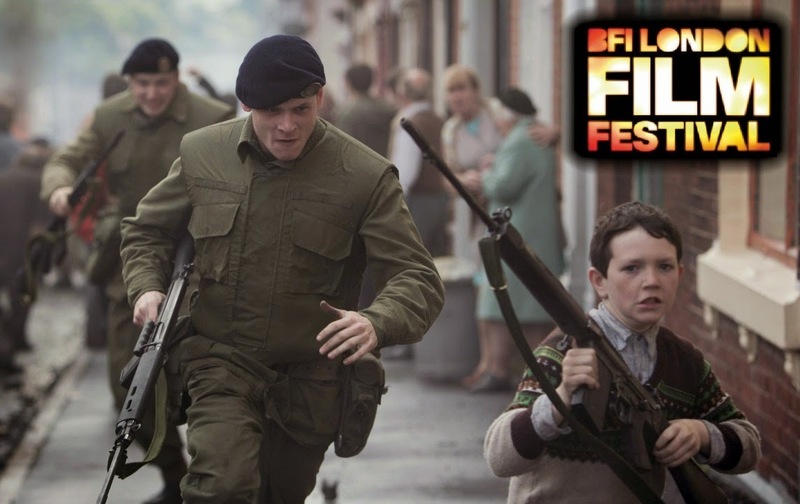 Think Die Hard in Norn Iron; an action thriller grounded in the most brutal reality, one where kids run around with rifles or hide guns for IRA killers while the men transport shoddily-constructed bombs around in inadequately sturdy holdalls. From that first, distressing riot scene, Demange pumps up your blood pressure and refuses to stop pumping until the credits. A chase through the West Belfast streets is Bourne-levels of exciting, but here you know that if the cat catches the mouse there won't be a lengthy scrap; the cat will simply blow the mouse's brains all over the wall. Gary's confusion and desperation are palpable, and O'Connell, a baby-faced hard man, nails the character. He doesn't say much: O'Connell and Demange deliberately stripped back Gary's dialogue, relying on the former's ability to sell emotion physically. One wordless kill is depicted with such surprising tenderness that it's almost heartbreaking. But the thrills come from Demange's inspired direction, Tat Radcliffe's innovative cinematography and Chris Wyatt's judicious editing. Radcliffe's camera is almost constantly on the move: nobody stands still for long in West Belfast, and Demange makes sure you know it. He opts to go handheld whenever we're with Gary, and does an uncanny job of pulling you into his disorientated, unpredictable world. An amazing, unbroken shot in and around a pub is so brilliantly shot that I'm still scratching my head wondering how it was achieved. Conversely, scenes of shady meetings between Gary's pursuers or the undercover Military Reaction Force (headed by a wiry, lethal Sean Harris) trying to get him back to safety are shot with a calm, measured steadiness. Gregory Burke's script adds tricksy subplots and touching drama to the action without recourse to cliché or overt politics (the line between good guys and bad guys is necessarily blurred), and switches from disarming moments of light-heartedness to gut-wrenching horror, sometimes in the space of a single frame. It's no wonder '71 is nominated at this year's London Film Festival for the Sutherland Award for best first feature - it's one of the tensest, most satisfying thrillers for a long time. That it manages to frame a rollercoaster action film in a recognisable and sensitive milieu is remarkable; that it does it so well is nothing short of miraculous.